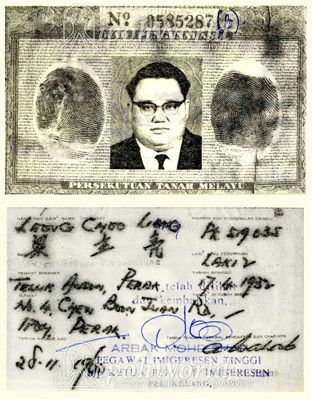 The above photograph and scans (Birth Certificate, Citizenship, Identity Card and Mutial Aid Fund Membership Card ) show the background to Edward Leong Choo Liang who was born in Teluk Anson on 17th April 1932, one of the sons of Leong Boon Swee a police officer who had emigrated from China to Malaya. Educated at ACS in Ipoh, he took a great interest in martial arts and wrestling as, it is said, that he had learned Ju Jitsu from Japanese officers following the invasion of Malaysia in 1941. He also learned Judo and became a black belt in the 1950s. With these interests he soon developed a Knowledge of different Aikido, Judo, Ju Jitsu, Karate and Kung Fu and from these he developed a system called Atado for western servicemen stationed in the Far East after WW2 - a few of whom became instructors. Although not tall, Leong Le Fu was immensely strong. Leong Fu was spotted by an American promoter who encouraged him to pursue a professional wrestling career in Europe and Asia which saw him tour internationally until he retired from the ring around 1963. So, from humble beginnings in small-time wrestling bouts in Ipoh he became known as the Chinese Wresting Champion of the World. On retirement from the ring he became a well known author and teacher of martial arts and then embarked on his very successful venture as the owner and franchiser of Old Cottage Pork and Chicken Chops food stalls; a brand that spread like wildfire throughout Malaysia. The following is the text of an article written in The Star newspaper in 1987 which describes his life up to that time. "At 114kg (250Ibs), the 1.62m (five foot four) Leong Fu was hardly a giant. Yet Leong, billed as the Chinese wrestling champion of the world in the 50s, beat the dreaded King Kong, unofficial world wrestling champion twice. He also knocked out four of King Kongs teeth in three fights over the years, and King Kong, at 1.8m (six feet) and 181kg (400Ibs) was no walkover. Leongs fearlessness and prowess stemmed from the fact that he was a kungfu expert - his "killing" blow was the Judo Chop --and he had also garnered enough experience in wrestling by fighting his way through Europe and the United States. However, Leong now delivers chops of a different kind. He and his wife, Ho Lim Meng, now run a stall selling chicken- and pork chops at a restaurant in Ipoh Garden South. Still, Leong, 55, cannot forget his exciting past. . "I had just returned to Malaya after a successful performance in Europe, England and America. "King Kong was a formidable foe, considering that I was only five feet four inches tall and weighed 2501bs," said Leong, proudly noting that he was then known as the "Chinese wrestling champion of the world" - "The newspapers billed the fight at Bukit Bintang Park in Kuala Lumpur on November 30, 1957, as The Greatest Challenge Fight Ever Staged in Malaya, " he said. "King Kong was billed as the unofficial world wrestling champion. According to an old cutting from the Singapore Tiger Standard, Leong had King Kong in trouble in their first encounter at the Happy World Stadium in Singapore. Leong, said the report was well on the way for a quick kill with his forte, the Judo Chop, when h missed King Kong and hit the ring post instead. The fight was declared a draw - but not before King Kong had lost four of his teeth in the course of the fight. On their second encounter, Leong said, he emerged the victor in the fight at Bukit Bintang Park, Kuala Lumpur, when he temporarily paralysed King Kong with chops to the nerve centres. "I fought King Kong again at the Jubilee Park in Ipoh later that year and was able to defeat him once more. I had great support from the local crowd," he said. Leong then disappeared from the public view for the next three decades, changing his career several times. From professional wrestling he became an author of martial arts books, a publisher, a contractor, and a property broker before turning food stall owner. Born in Teluk Anson (now Teluk Intan) in 1932, the young Leong studied till his Senior Cambridge examination at the Ipoh Anglo-Chinese School. His father, Leong Boon Swee, was a police officer who later became a well-known planter in the State. There is a road in Ipoh named after him. Leongs family is still well-known in Ipoh. 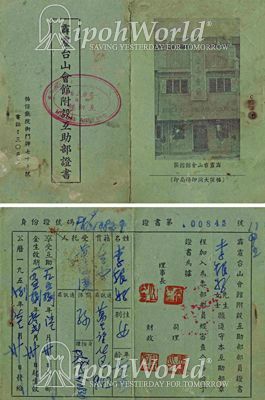 His elder brother, Choo Meng, used to teach in Ipoh; his elder sister, Kwee Cheng, practiced medicine in Ipoh until she migrated to Australia: and one of his younger brothers is a senior lawyer in Ipoh. 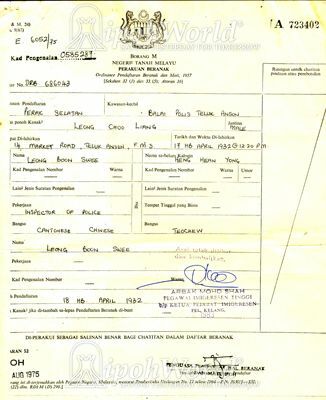 Leona learnt Chinese martial arts in Teluk Anson and ju-jitsu from a Japanese officer during the Occupation. 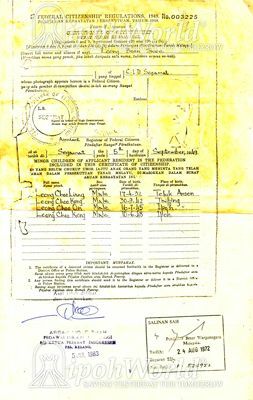 He was also interested in wrestling and participated in several local amateur bouts in Ipoh after the war. He soon caught the eye of British wrestling promoter George de Relwyskow, who moulded him into a professional wrestler in England. In 1955, the 23-year old Leong began his 10-year professional wrestling career, when he packed his bags and headed for Leeds with his wife. In his fights he was given the name Lee Leong Fu by his promoters "to give him a more Oriental image." At one time he added drama to the image by keeping a pigtail, and wearing a black skullcap and Chinese Mandarin costume. Leong quit professional wrestling in 1965 because he wanted to retire while he was ahead; he was also becoming tired of living out of a suitcase. "During the 10 years it was like living out of a suitcase. One day we are in London, the next in Paris, Germany, Ireland and so on. I just felt like quitting while I was still in one piece," he said. He was encouraged by his wife, who spent many nail-biting moments by the ringside watching him grappling with burly mat men. "Like the wives of the other wrestlers, I was worried that he would be hurt badly in the ring. I used to chew a lot of soft sweets to ease the tension watching his matches," said Mdm Ho. On his return to Ipoh, Leong started to write books on martial arts. His published books include Shaolin Kungfu, Kungfu Karato and several booklets • He also owned The Strand publishing house in Jalan Anderson (now Jalan Raja Musa Aziz). "I based my writings on the techniques taught to me by European masters who had spent years learning the art in China," he said. Leong also gave correspondence courses in kungfu fighting. His courses were translated into Italian, German, French and Dutch by the Burlitz School of Languages, London. While penning martial art techniques and running his publishing firm, he also ventured into the construction and brokerage business. However, his financial position suffered when the recession hit in the early 1980s. Leong claimed that he started the Old Cottage Pork Chop business with "providence's help" after he had found out that he was starting to go blind in 1986. "My wife and I had wanted to start a grilled fish stall. But when the proprietor of Cheong Seng Restaurant in Ipoh Garden South asked us what business we were starting, we answered "pork chop"
"We were really surprised at our decision but things turned well for us. As a reborn Christian, I believe that it was the wisdom of the Lord that guided us," he said. He now loves to preach to his customers, given an opportunity. Leong, now in safari - suit and his cheongsam - clad wife serve their customers at their stall from 6pm to 11pm nightly. They charge $3.60 for a plate of pork chop and $3.95 for chicken chop. "We picked up our culinary skills when we were travelling in Europe. From our experience we have managed to concoct a recipe which our customers enjoy," said Leong. Since business is picking up, Leong has started another stall at the Restoran Sin Lok Yuen in JaIan Pasir Puteh. "We are now considering several offers from friends to help us financially in opening more outlets," he said." Over 1987 and 1988 the Old Cottage brand not only opened more outlets, but was a runaway success and through effective franchise arrangements expanded dramatically both in locations and products as the following parts of this story will demonstrate. The popular business continued steadily until Leong Fu passed away on 6 January 1991 in Ipoh from a stroke. At that stage there were outlets all over Malaysia from Penang in the north to Johore Bahru in the South and even as far as Kota Kinabalu to the East. 10 towns and some 12 outlets. What a success! After Leong Fus demise from a stroke on 6 January 1991, in Ipoh., Mrs Leong Fu (@ Esther Ho) sold the business and moved in with her daughter in Kuala Lumpur. Sadly, the new business operator did not continue the business for long. He is remembered as a generous man who gave his time freely to all who wanted to learn, especially the wrestling moves. To read about Leong Fu's book, Mind Force Principles Of Authentic Chinese Self-Defence Kung Fu Karato, click here. To read about The Chinese Kung-Fu Karato (Atado) By Leong Fu, click here. To go to Part 02, click here.